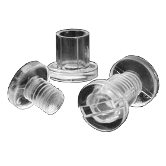 These small head plastic screwposts are molded in an extra clear resin. They are an attractive alternative to our black or white plastic screwposts. They're just as easy to assemble — just push them together with your fingers. Clear posts should be considered permanent once assembled. It is usually not possible to disassemble them. All clear screw posts have a slot on the post head and a plain head on the screw. Clear screw posts are made from a clear resin.